A maigrim is a primar heidache disorder chairacterised bi recurrent heidaches that are moderate tae severe. Teepically, the heidaches affect ane hauf o the head, are pulsatin in naitur, an last frae twa tae 72 oors. Associated symptoms mey include nausea, vomitin, an sensitivity tae licht, soond, or smell. The pyne is generally made worse bi pheesical acteevity. Up tae ane-third o fowk hae an aura: teepically a short period o veesual disturbance that seegnals that the heidache will suin occur. Occasionally, an aura can occur wi little or na heidache follaein it. ↑ 1.0 1.1 1.2 1.3 1.4 "Headache disorders Fact sheet N°277". October 2012. Archived frae the oreeginal on 16 February 2016. Retrieved 15 February 2016. ↑ 2.0 2.1 Aminoff, Roger P. Simon, David A. Greenberg, Michael J. (2009). Clinical neurology (7 ed.). New York, N.Y: Lange Medical Books/McGraw-Hill. pp. 85–88. ISBN 9780071664332. ↑ Piane M, Lulli P, Farinelli I, Simeoni S, De Filippis S, Patacchioli FR, Martelletti P (December 2007). "Genetics of migraine and pharmacogenomics: some considerations". The journal of headache and pain. 8 (6): 334–9. doi:10.1007/s10194-007-0427-2. PMC 2779399  . PMID 18058067. ↑ Lay CL, Broner SW (May 2009). 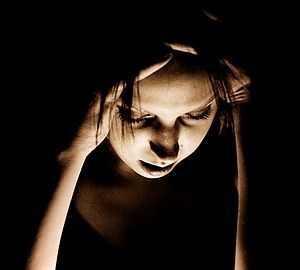 "Migraine in women". Neurologic Clinics. 27 (2): 503–11. doi:10.1016/j.ncl.2009.01.002. PMID 19289228. ↑ 5.0 5.1 Bartleson JD, Cutrer FM (May 2010). "Migraine update. Diagnosis and treatment". Minn Med. 93 (5): 36–41. PMID 20572569. ↑ Olesen, Jes (2006). The Headaches (in Inglis). Lippincott Williams & Wilkins. p. 424. ISBN 9780781754002. Archived frae the oreeginal on 2017-09-08. ↑ "Cluster Headache". American Migraine Foundation. 2017-02-15. Archived frae the oreeginal on 2018-05-09. Retrieved 2017-10-23. ↑ Armstrong, C; American Academy of, Neurology; American Headache, Society (15 April 2013). "AAN/AHS update recommendations for migraine prevention in adults". American Family Physician. 87 (8): 584–5. PMID 23668450. ↑ Linde M, Mulleners WM, Chronicle EP, McCrory DC (June 2013). "Valproate (valproic acid or sodium valproate or a combination of the two) for the prophylaxis of episodic migraine in adults". Cochrane Database Syst Rev (6): CD010611. doi:10.1002/14651858.CD010611. PMID 23797677. ↑ Vos, T; Flaxman, AD; Naghavi, M; Lozano, R; Michaud, C; Ezzati, M; Shibuya, K; Salomon, JA; et al. (Dec 15, 2012). "Years lived with disability (YLDs) for 1160 sequelae of 289 diseases and injuries 1990–2010: a systematic analysis for the Global Burden of Disease Study 2010". Lancet. 380 (9859): 2163–96. doi:10.1016/S0140-6736(12)61729-2. PMID 23245607. ↑ 12.0 12.1 Headache Classification Subcommittee of the International Headache Society (2004). "The International Classification of Headache Disorders: 2nd edition". Cephalalgia. 24 (Suppl 1): 9–160. doi:10.1111/j.1468-2982.2004.00653.x. PMID 14979299. as PDF Archived 2010-03-31 at the Wayback Machine. ↑ Pryse-Phillips,, William (2003). Companion to clinical neurology (2nd ed.). Oxford: Oxford university press. p. 587. ISBN 9780195159387. Archived frae the oreeginal on 2017-03-13. This page wis last eeditit on 14 September 2018, at 05:35.